PouchNation provides a platform for registration and accreditation of everyone applying to attend your event. We are the best event accreditation service, online streaming, artists are turning to live music as a big source of income. Let’s zoom in on some stats. From 1999 to 2014, sales of recorded music have fallen drastically by 44 percent, while live music, consisting mainly of concert ticket sales, has bucked the trend. Live music looks set to grow further over the next few years. PricewaterhouseCoopers forecasts that the sector will generate a revenue of US$30.9 billion in 2019 (PDF link), up from around US$26 billion in 2014. It’s not hard to see why this changing landscape could lead to a gold rush for startups dealing with live events. Despite the industry’s phenomenal growth and live music being the new thing, it continues to be weighed down by old ways – meaning everything is still largely organized and run manually, from ticket sales to crowd control and payment of goods inside the venue. That’s where the startups come in. For example, startups can offer onsite logistics as a service. When equipped with smartphones and tablets with barcode scanners and check-in apps, event staff can instantly verify tickets at the gates, allowing for shorter lines and quicker entry. Real-time data entry also helps event staff make on-the-spot decisions. Once the event is over, all data and information gathered will allow organizers to plan ahead for next year’s event. Aside from making better use of mobile phones and tablets, startups are bringing wearable technology such as RFID tags or wristbands to concert or festival organizers. 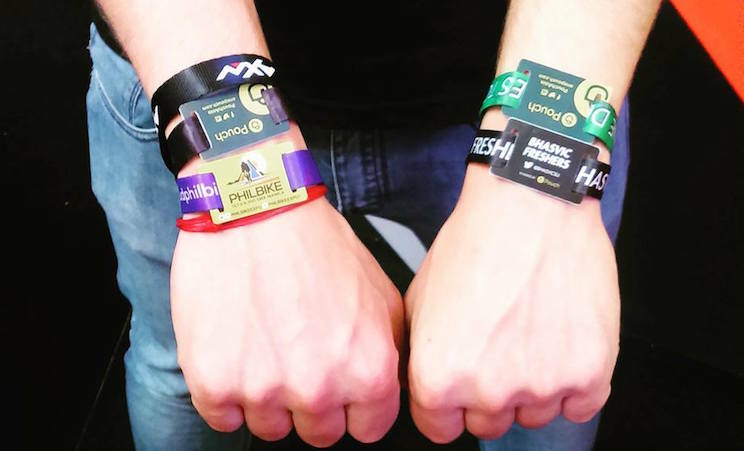 These wristbands allow for ticketless entry and help event organizers stem the sale of counterfeit passes. More importantly, they enable cashless payments at the gig, curbing theft and fraud. With cashless payments, concert-goers need not worry about losing their wallet or purse in the crowd, while vendors selling food, drinks, and merchandise are assured that no fraud takes place during transactions because everything’s recorded. If it’s a really big event, the wristbands can be used by organizers in controlling the crowd by disallowing entry in restricted areas. The key thing in all this is efficiency. Some of the startups handling live events in Southeast Asia are Pouch and GoGorilla from Singapore, as well as Loket from Indonesia. “We’re a little surprised. There was more demand than we actually expected. Most of the experienced producers we came across have asked, ‘where have you been? We’ve been looking for you,’” says Pouch CMO Graeme Perkins. Citing a study by Frost & Sullivan, Graeme tells Tech in Asia the event management software industry’s total addressable market as of 2015 stood at US$30.5 billion, and it’s expected to grow to US$31.9 billion next year. “Not one company controls 12 percent of that market,” he says. If we’re talking about Pouch alone, Graeme claims the company, which raised seed funding last year, has overshot targets set with investors after handling several live events, including Chris Brown’s and Lifehouse’s concerts in Manila. This year, the startup bagged the Kanye West-headlined Paradise International Music Festival that’s gonna happen in the Philippines on April 9 with 30,000 attendees. It’s also in talks with US and Europe-based groups, which want to license its tech. So the bottomline is: there’s a huge opportunity in live music, but it’ll probably take some time before we’d see widespread adoption of the latest technologies out there. The challenge lies in convincing event organizers about the benefits that startups like Pouch bring. Doing stuff manually, the old way, is expensive and you don’t get much useful data out of it. And although things like RFID involve extra costs, the price of such tech is expected to go down as they become more common. Plus, organizers will see lots of savings from automating tasks.